As our recent Euro-eating-trip was approaching, Rocky and I were supposed to be going easy on the eating out and saving money for our Copenhagen-Denia-San Sebastian line-up. 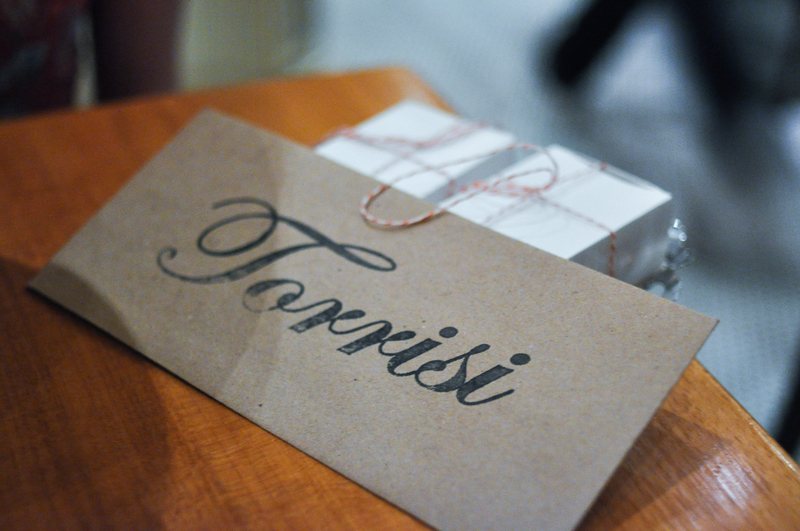 But coming up on my last night off work before departure, I couldn’t help but call up Torrisi to see if they could get us in for their Chef’s Tasting Menu. After a moment on the phone, on and off hold, we were good to go. 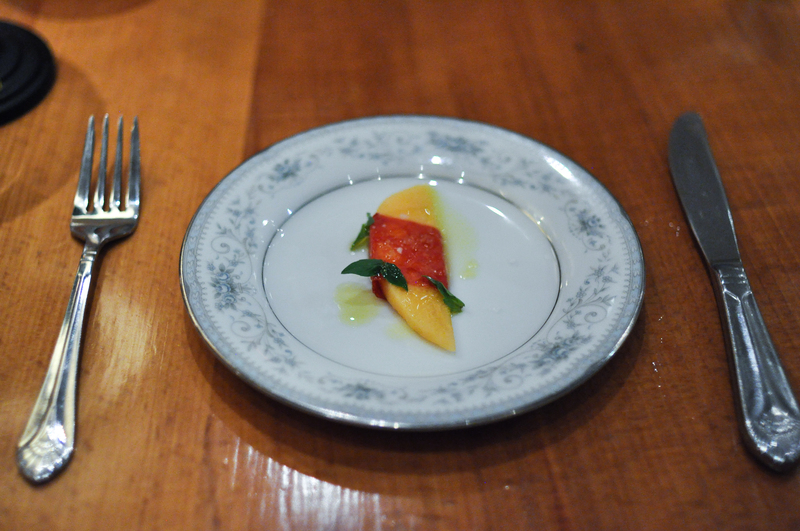 The menu was composed of roughly 20 ‘courses’, each paying homage to the history of NYC dining and food culture. 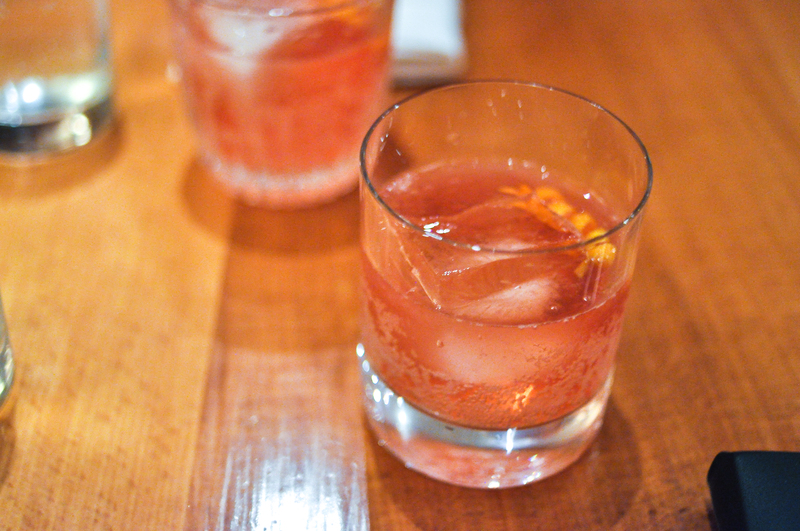 OUR AMERICANO. American in Italy. A bitter drink started the night. I believe it was something like Grapefruit, Wormwood, Cherry Bark, and Ginseng. 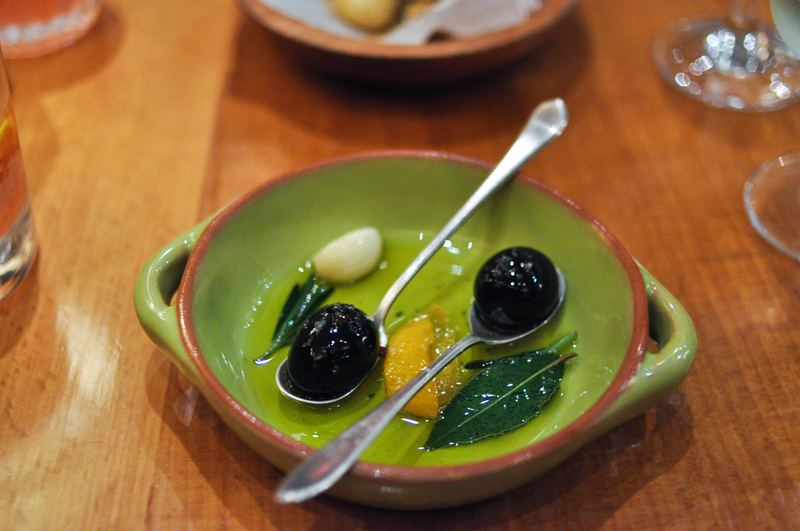 THE QUAIL’S OLIVE. 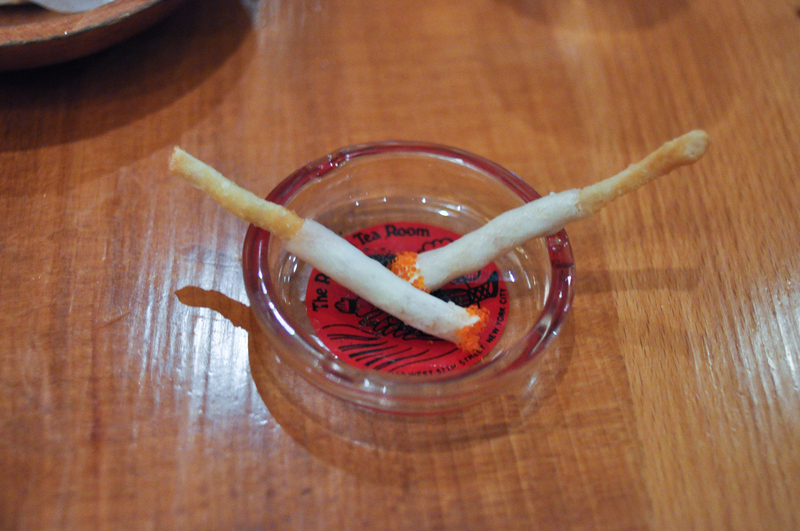 Canned Bar Snack. Olive-brined quail eggs. They seemed more about the novelty than an attempt at a great flavor combination. PRETZELS. Street Cart. Soft pretzel bites with caraway and mustard. 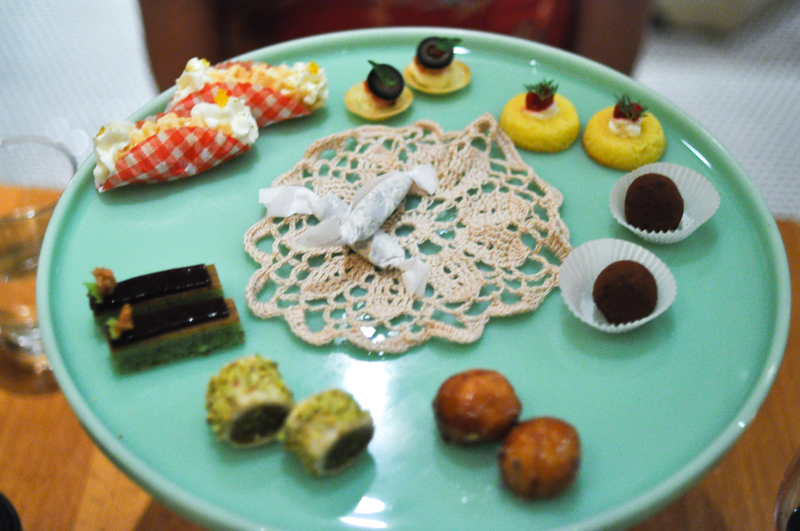 A great little snack, but a stretch to be called a course. SABLE CIGARETTES. Stork Club. 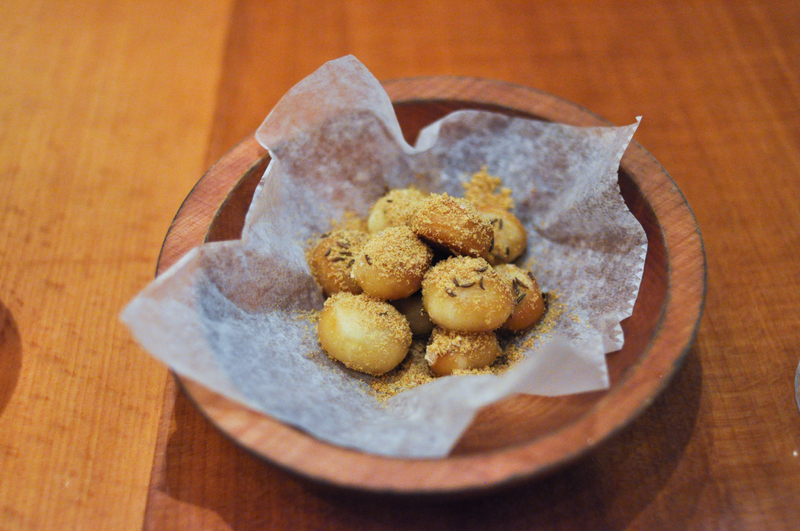 Gnocco fritto, wrapped in smoked sable, dipped in cod roe, with poppy seed ash. Despite the gimmicky nature of this snack, I thought it was delicious. OYSTERS. Bloch & Guggenheim Deli Peppers. 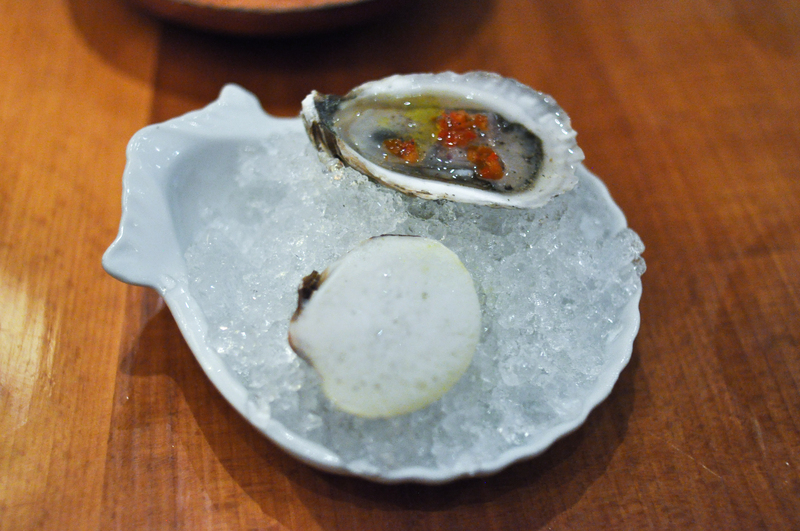 The peppers left a nice spice on the finish to follow the brine, but were a little strong for the oyster. LITTLE NECK CLAM. on the Half Shell. The foam had great acid and a little bitterness to compliment the clam and balance with the neighboring half shell. 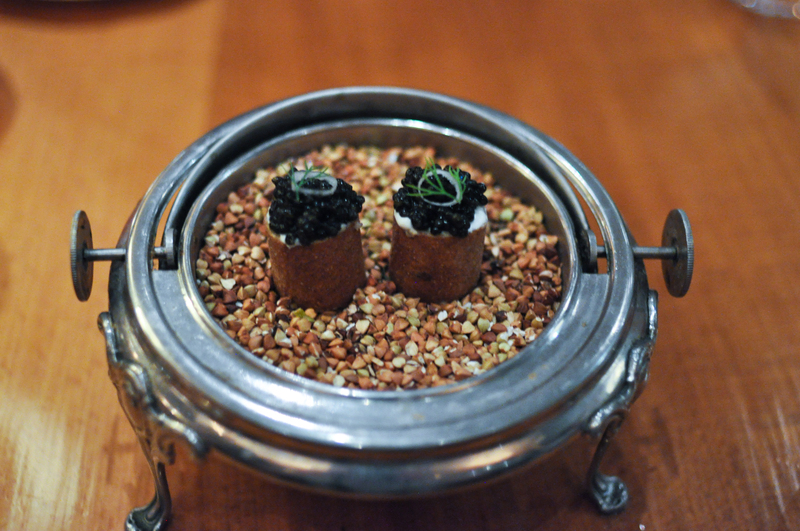 BUCKWHEAT CAVIAR KNISH. Yonah Shimmel Celebrates. Brilliant. 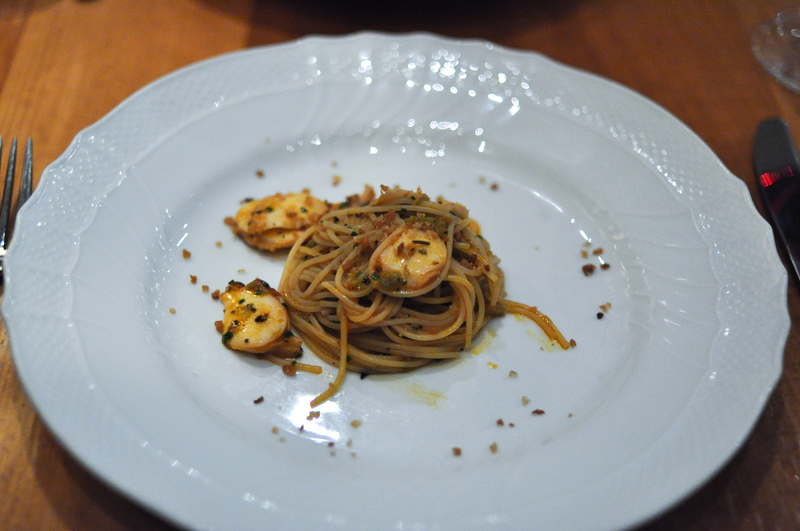 The crunch of the buckwheat, the Hackleback salinity, a little red onion. Great snack. RABBIT TERRINE. Toasted Italian Bread. Another winner. Rich rabbit game, nicely seasoned, countered by sour cherry jam, lemon zest, and rosemary. CASHEW CHICKEN. A Southern Mulberry Classic. 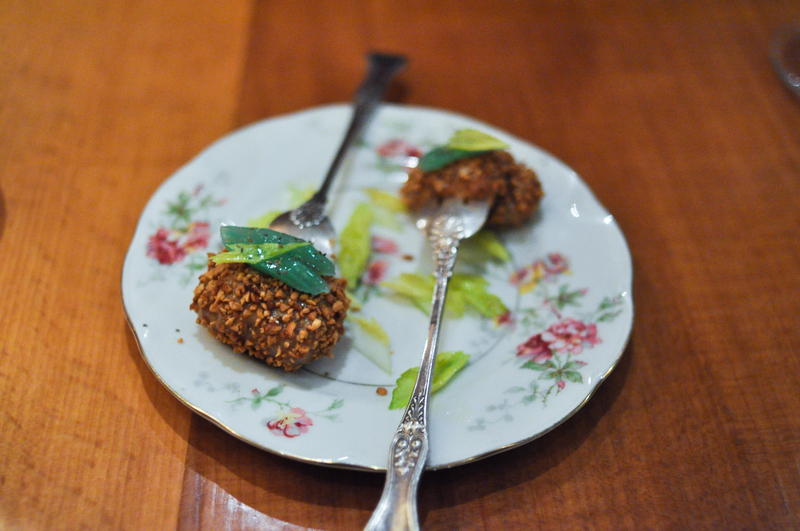 Fried chicken oysters rolled in chopped cashews, served on century-old Tiffany & Co. spoons. Outstanding. PROSCIUTTO’D MELON. Eldorado 5-8654. A lovely slice of melon, with a beautiful cut of prosciutto. Some livening freshness from the herbs, and a few big salt crystals. Simple, classic, and perfect. RAW CAPONATA. Bensonhurst BBQ. The feature of the dish, the BBQ eggplant, fell pretty flat. Though the caponata was nice, with good vegetable crunch and a little spice. The raisin creme fraiche ice cream gave a pleasant cooling effect. MACKEREL IN CRAZY WATER. Atlantic Aqua Pazza. 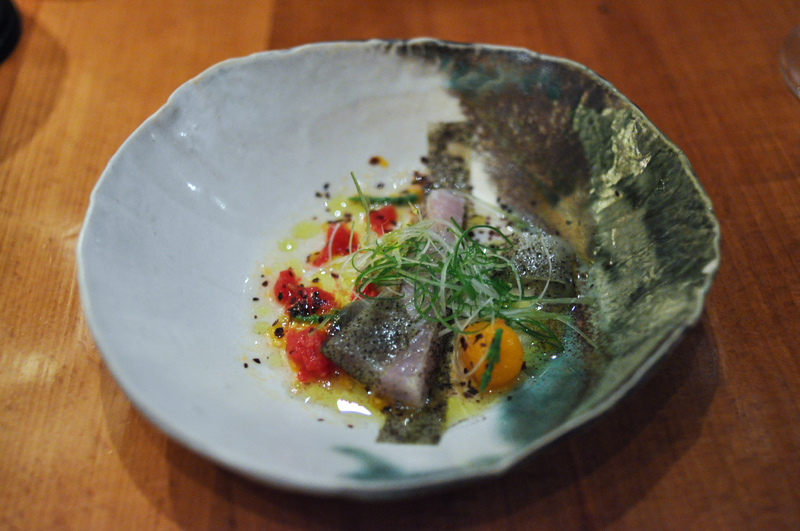 A pretty slice of Mackerel, barely touched, accompanied by seaweed ash, sea beans, and tomato compote, and finished with a fantastic acqua pazza. 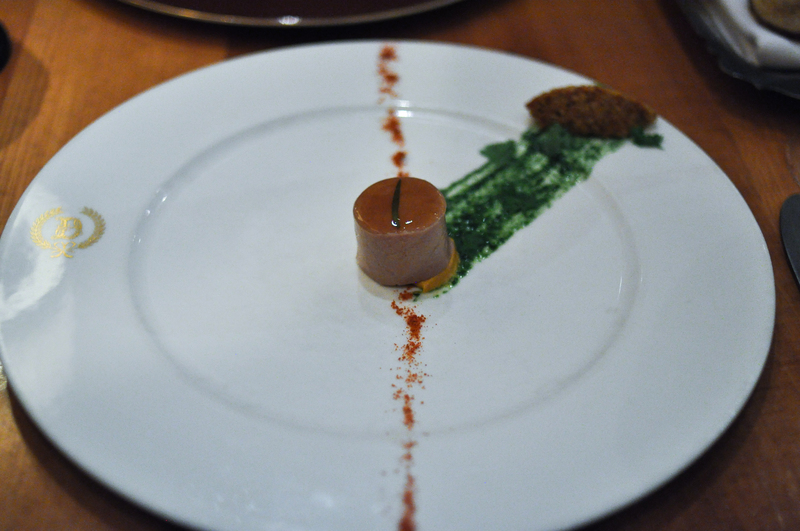 FOIE GRAS NEWBERG. Wenberg & Ranhofer. 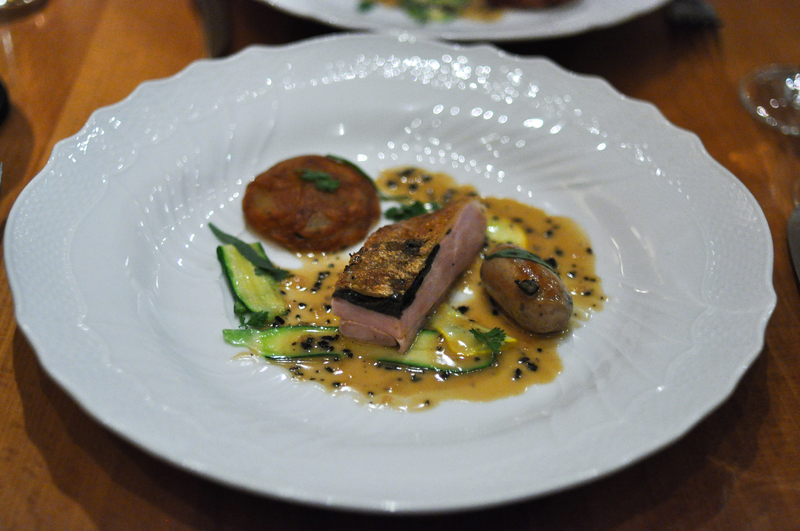 Excellent foie. Rich and smooth. Topped with brandy gelee. A fowl take on the original Lobster Newberg. 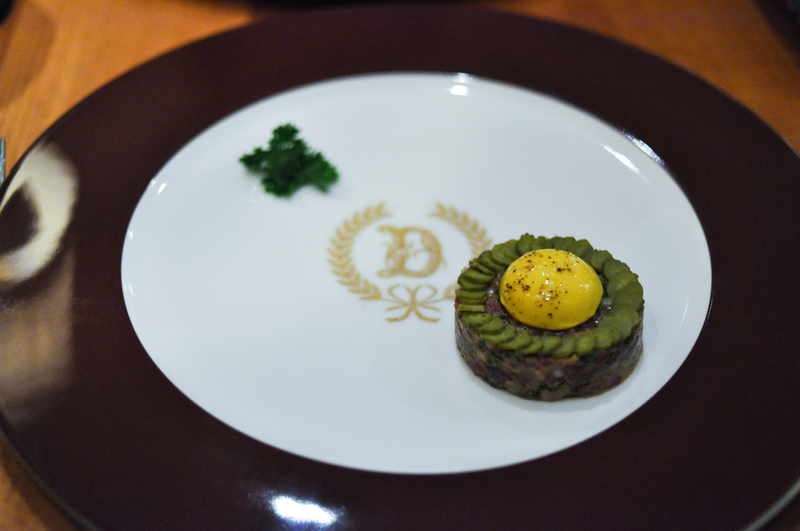 DELMONICO STEAK TARTARE. 25 William Street. 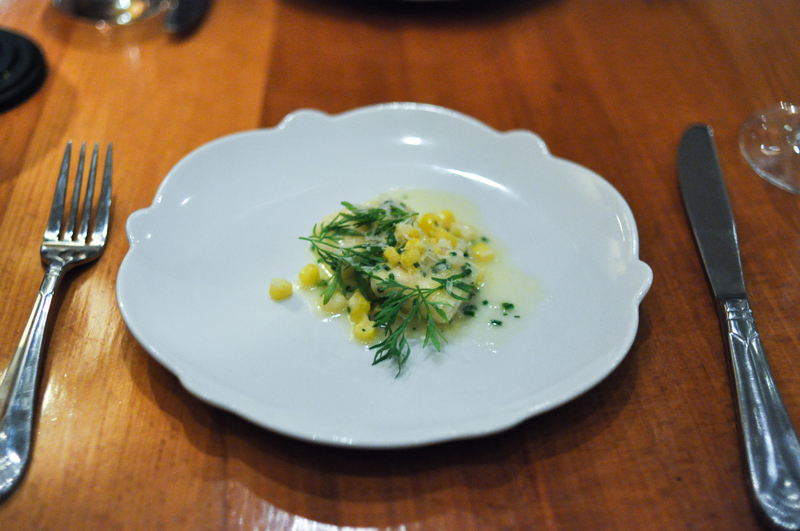 A bold flavored tartare with a good amount of black pepper, petite cornichons, and encapsulated béarnaise. SHEEP MILK RICOTTA GNOCCHI. Dancing Ewe Farms. Well-executed ricotta gnocchi tossed with buttery sweet corn. This plate was damn delicious. OCTOPUS SPAGHETTONI. A Sunday on Long Island. The octopus was nicely tender with a strong ocean flavor. Toasted bread crumbs were a plus, texturally. The dish was initially too spicy for me, but I numbed to it fairly quickly. LAMB CAPELLACI. Pope John Paul Goldstein III. Artichoke hearts, matzah, mint, Manischewitz. Good pasta, the lamb was cooked well, and none of the components were overbearing. A pleasant dish. 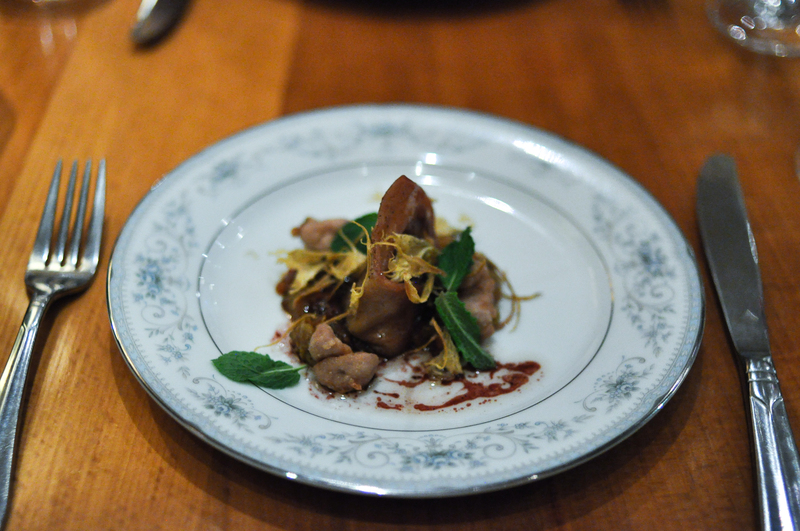 DRY-AGED GUINEA HEN. French in Italian. Black truffle. Boudin noir. This was a great plate. Nothing ground-breaking, but honest and impeccable. CHEESE DANISH. Bagel Shop. 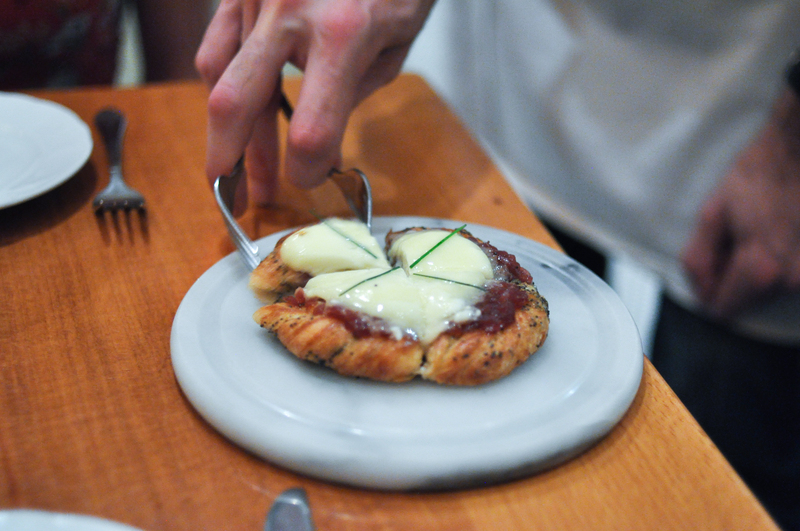 A fluffy, buttery, poppy seed danish, with sweet onion jam and cheese. A tasty, balanced, composed cheese course. 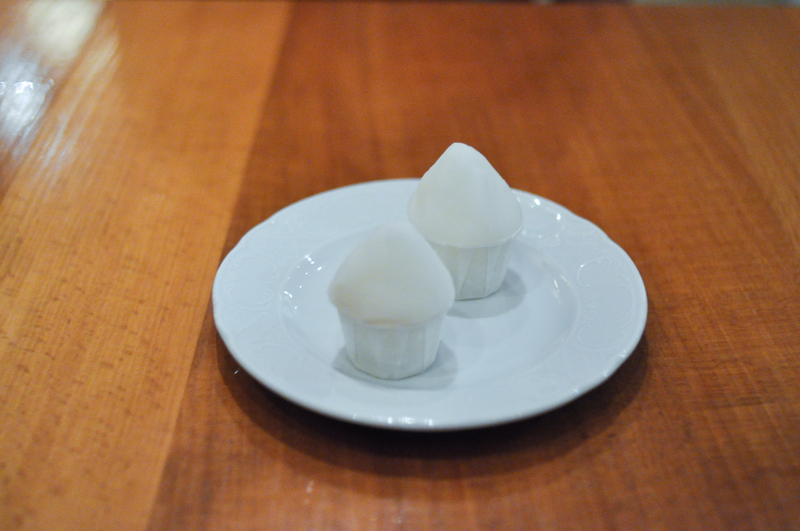 GINGER ITALIAN ICE. The Corona King. Pretty much what one could expect from ginger italian ice. Densely packed, and almost spicy in flavor. MARASCHINO FLOAT. Soda Parlor. 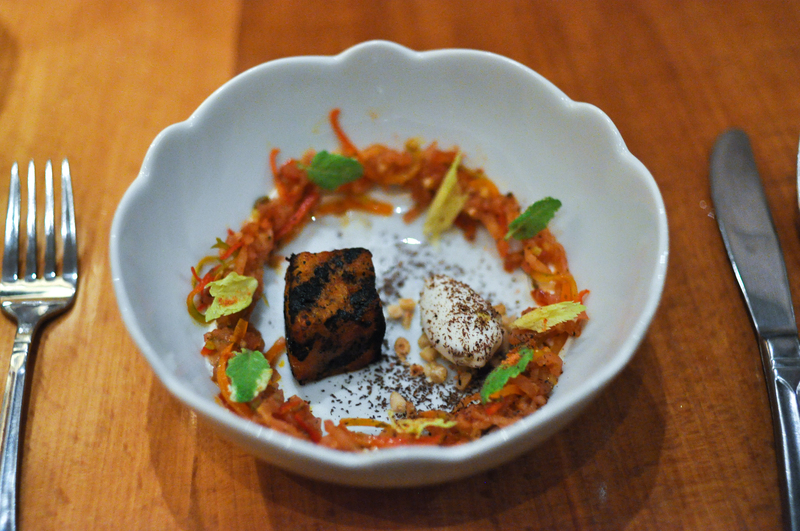 The root beer financier was great. 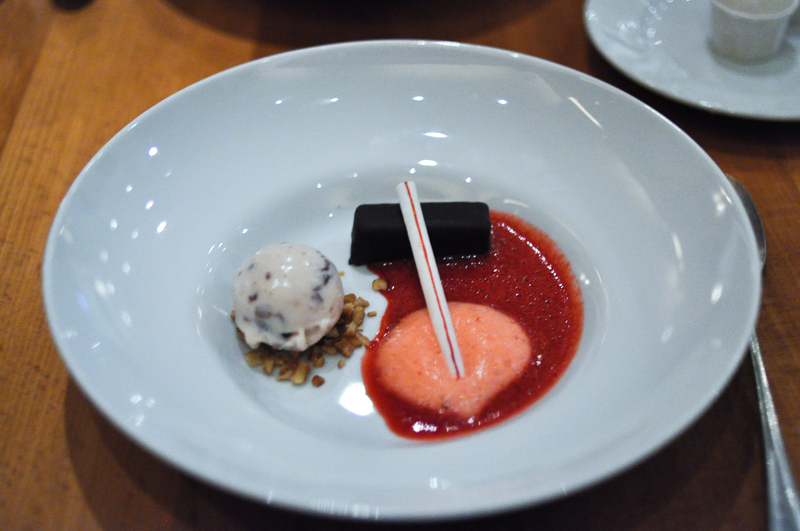 Sour cherry ice cream over pretzel crumble was great as well. The milk straw and cherry soda were a nice novelty. PASTRIES. Ferrara Bakery. Let’s see if I can name all these…Ricotta cannoli with orange zest. Polenta cake with ricotta and rhubarb. Peppermint truffles. A honey something that just kind of poofed away. Seaweed Taffy, dry and bitter. An interesting and kind of unpleasant olive wafer. A pistachio thing. Celery cake with concord jelly, which was much better than expected. A take-home menu and some rainbow cake/cookies. 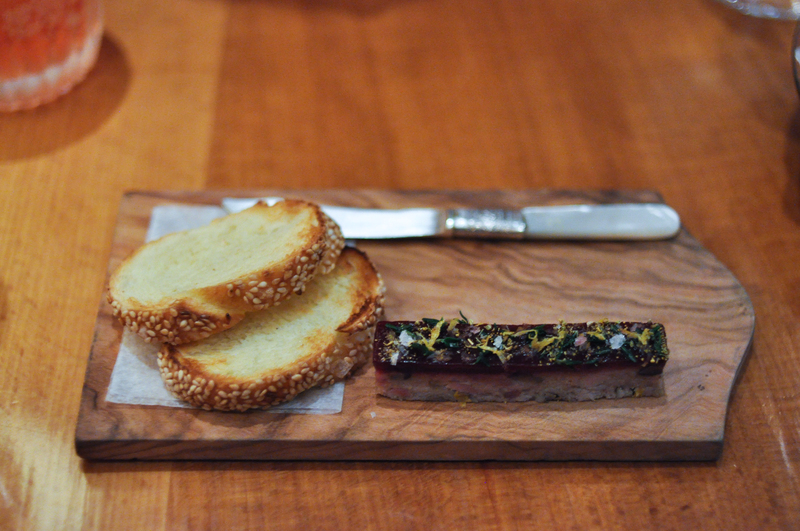 Rich Torrisi and Mario Carbone certainly have good things going with their current restaurants. They make food and experiences that are fun and honest. I’m excited to check out their new endeavor: Carbone, which is aiming for a late fall opening.